We’ve recently discussed some eco-friendly kitchen ideas including windows, appliances, cabinets and floors, and it would just feel wrong if we stopped there. Kitchen countertops are a great area to add some “green,” as well as some color pops that really jazz up the décor. Sure, you’ve heard of granite, laminate and even butcher blockcountertops, but here are some green countertop ideas that may not be so top-of-mind. There are a couple different options for glass countertops. You can have an all glass solid surface countertop installed, or a terrazzo, chipped base surface, which we’ll cover here. 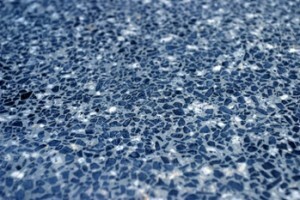 Terrazzo surfaces are created from a mixture of broken or crushed post-consumer glass pieces, and a binder of either cement or petroleum….which is sometimes the not so green part. The problem therein lies with the manufacturing plants, and the gasses they emit into our atmosphere. So if you choose concrete, make sure they use fly ash, a waste product of coal burning, which usually ends up in landfills. If you choose resin, make sure the petroleum is formulated from a plant-based source. The sources for the glass are numerous; curbside recycling, salvaged glass from old buildings, and waste streams just to name a few. The colors and styles are simply endless. This is where you can let your imagination run wild, and wait until you see how it reflects the light! Yes paper. This is not a new technique; paper countertops have actually been around for years in the industrial and marine fields. Recycled paper countertops resemble stone in their look and feel. They are surprisingly durable; stain, scratch, and heat resistant. The paper typically comes from post-consumer waste, and includes anything from cardboard to office paper, newspaper and magazines. It is mixed with a petroleum free resin, and does not give off toxic chemicals into your home. So in grading this paper, we give it an A+. With all of the cooking shows on TV now, stainless steel counters have become very popular with chefs, or even the “want to be” chefs. This gives such a clean modern look and is extremely sanitary. To put the eco-friendly spin on things, let’s give recycled aluminum some attention. There are a couple different looks you can achieve with aluminum, aside from the many colors and finishes available. Typically, the recycled aluminum does not look like a sheet of metal; instead it resembles an almost stone look. Countertops can be made from aluminum scraps and dust that have been melted down, mixed with a resin, and poured into a mold. If you would rather have the solid sleek look, you can install sheets made from recycled aluminum. There are more kitchen countertop options available now than ever before. Just make sure you do your own research and take the time to speak with experts to find out which countertop will be the best fit for your kitchen.